Many of us don’t think to give in small amounts because we don’t think it will make a difference. Take a moment to consider that only $2.04 can give one man or woman a hot, nutritious meal at the Mission. $2.04 has the power to help but more importantly, 1 person can make a huge difference in the lives of the homeless. Check out these fundraising programs and ideas and get started today! The Kroger Plus Card you already use for discounts has even more value now — community value! Each time you use your registered Plus Card when purchasing groceries, Kroger makes a donation to City Gospel Mission to help feed the hungry in our community. It’s that easy! Learn how to register your card today! 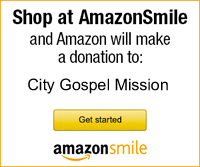 Amazon will donate 0.5% of the price of your eligible AmazonSmile purchases to City Gospel Mission whenever you shop on smile.amazon.com. AmazonSmile is the same Amazon you know. Same products, same prices, same service. Support City Gospel Mission by starting your shopping at smile.amazon.com. The first time you visit this website you will be asked to select your charity. Search for “City Gospel Mission” and select it from the list. You can use your existing Amazon account on smile.amazon.com. Your shopping cart, wish lists, wedding or baby registry, and other account settings are also the same. You can help Cincinnati’s hungry and homeless men, women and children when you do your regular grocery shopping each week! City Gospel Mission will receive a percentage of the money you spend at Remke Markets when you participate in fundraising program sponsored by the grocery giant. To participate, simply link your Remke card to City Gospel Mission at www.remkes.com. Click on the account link in the upper right hand corner. All card registrants will need to re-enroll to benefit City Gospel Mission every September 1. Questions? Contact Melissa at melissat@citygospelmission.org. We’re excited to announce our new partnership with HomeSown.org, a unique organization that helps you make a difference in the world through your home sale or purchase. BUY OR SELL: Your Trusted Local Agent will help you sell and/or buy your home like any other transaction. CITY GOSPEL MISSION RECEIVES A DONATION: Upon closing, HomeSown.org makes a donation to City Gospel Mission! If you are planning to buy or sell a home this year, visit HomeSown.org to be connected with a Trusted Local Agent to guide you through the process. This simple step will mean a generous donation to help those in need. The Japanese English as a Second Language Class of First Church of Christ in Burlington, Kentucky helps local Japanese women meet friends, improve their English skills and learn about American culture. The Japanese ESL Class wrote a cook book that included American and Japanese recipes. Members of the class generously gave a portion of the proceeds, $715, to City Gospel Mission to help the homeless. When John turned six years old the only birthday present he wanted was to feed the homeless. He told his parents, family and friends to give to City Gospel Mission instead of giving him presents. In all, City Gospel Mission received $470 in donations from John’s family and friends! Do you have a fundraising idea that you’d like to talk about? Contact Paul Spence at pspence@citygospelmission.org or call (513) 345-1048.